We are being dumped on by Katia currently with flood warnings all over the place. When the rain is insane, I ride the bus for a few reasons: 1) it is drier, 2) riding through puddles here is dangerous as they could be an insanely large pothole. Flats or wrecks in the rain are no fun. 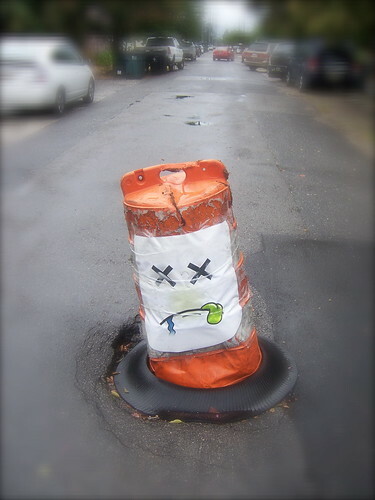 potholes will attack in New Orleans! Today started nice enough, but I knew it was coming so I took the bus to the office after lunch. The wind was getting crazy and the thunder was rumbling. 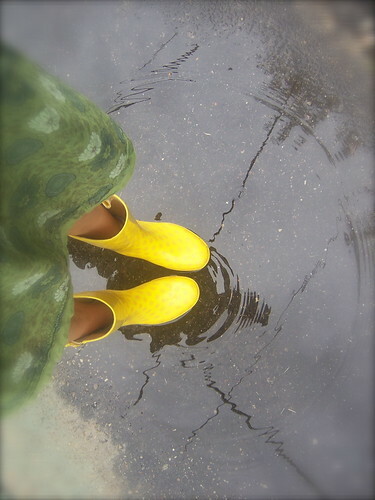 Rain boots, a dress and an umbrella was all I needed to get home dry(ish) and stylishly! After my stop, I took a rest at my favorite pizza joint for $5 pizza and pint while watching folks go in and out of the neighborhood bike shop, Mike the Bike Guy (who is awesomely cool). Beer in hand (no open container laws here! 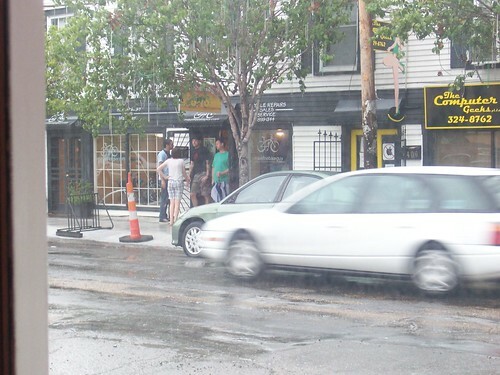 ), I stopped by and said hello to Mike and company, then walked home in the rain. A few puddle jumps later and I was home and drying off. 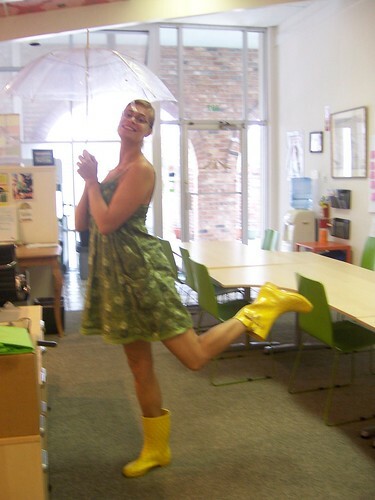 What do you do to make the best of a stormy day? Do you ride even through flood warnings? Do share! dang girl, look at those calves! niiiice! and the boots are awfully cute too. JJ-Thanks! I hadn’t noticed, but you are right…they are looking awesome. Hells yeah. Your rainy ensemble is so cute! (And so right, calves are amazeballs.) Stay safe out there, my friend! 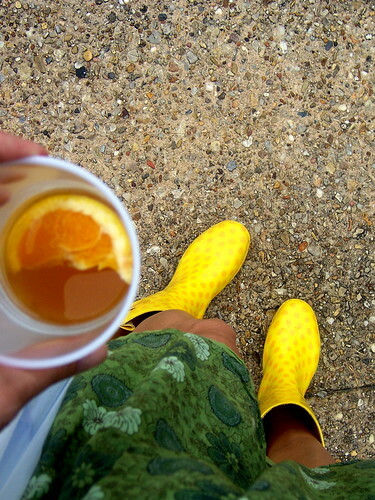 Adorable rain boots! Being able to take public transit in bad weather is A+. Good to hear that New Orleans has a helpful bus system. Dottie- the NORTA (New Orleans Rapid Transit Authority) is really incredible. They just upgraded every bus as well as their website. Such a refreshing change. Full write up coming soon! I agree – riding through puddles is not advisable as they can hide huge, bike-eating holes. Sometimes, it can’t be avoided so the trick is to go slowly. Rain at night is the worst. I have often said that the folks in charge of road maintenance should be required to ride on those roads, on a bicycle, in the dark, in the rain. I venture to guess that the potholes would disappear quickly!